The final round of matches in 2017 turned out to be a difficult week for St Andrews teams in the Dundee and District Table Tennis League. With Michael Hahn out due to injury, and Justin Yang in the middle of exam season, Prefects had a tough match against Aces, losing 10-0. Clyde Johnson did well to win a set against each of the trio of Jason Fleming, Mark Lundberg, and Grant Williams. Emma Bissett — who must be thanked for standing in at the last minute — also did well to win a set against Grant, whilst Bonifac Legrady was unfortunate not to take a set against Grant, having lost two sets at deuce. Swots also had a tough game against Brechin. Brechin’s John Anderson and Derek Mitchell were too strong, winning all of their singles games, and their doubles game together, for the loss of only one set when Dave Beveridge won a set against Derek. However, Emma Bissett and Collin Bleak both beat Aaron Robertson, and Dave was unfortunate to not add to the score-board as he lost to Aaron 11-9 in the deciding set in the first game of the night. Truants, who were leading Division Two before this fixture, also couldn’t get a win as they lost 6-4 to Lundin Lasers. Graham Wood did well to win his three singles games and Knut Radmer also won one of his singles games 3-1 against Ron Filsell, but Alain Leger was unable to pick up any sets on the night. Crucial to Lundin Lasers’ win was the doubles game, which Graham and Knut were unfortunate to lose 3-2. New Kids got the only win of the week for St Andrews, winning 7-3 against Comets. Ian Smith reigned supreme, winning his singles games 3-0, 3-0, and 3-1. Howard Lee finished his night with a strong 11-3, 11-8, 11-0 win over Jill Milne, but his first two games were much closer. He was unlucky to lose his first game 3-2 against Glenn Christie, but beat Fraser Smith 14-12 in the deciding set. Kong Wan also had two five-set games at the start of the night, losing to Fraser before beating Jill 15-13 in the deciding set. Howard and Ian combined to win a strong doubles game against Glenn and Fraser 3-1. Prospects drew 5-5 with Missiles, but were unfortunate not to win the fixture. Fabio Sani beat David Hunter and Jim Hodson 3-0 and came through in a tough 3-2 game against Daniel Russell. Sandy Pearson also beat David and Jim 3-0 but found Daniel too tough, losing 3-1. Dave Goddard was very unfortunate, losing all three games 3-2. This entry was posted in Match reports, St Andrews Table Tennis Club on December 29, 2017 by standrewstt. Having a free week of league fixtures, Prefects played their Stanley Doubles Cup match, with probably the hardest draw against last year’s league winners, Knights. Prefects had some chances in the first two games. Michael Hahn and Sascha Roschy, losing the first set against Stuart Halliday and Callum Riddoch, bounced back to win the second set and held an early advantage in the third set. However, they let it slip before comfortably losing the fourth set to give Knights a 1-0 lead. Similarly, Michael and Clyde Johnson had some chances against Stuart and Robert Toth, but lost 3-1. The next two games — Clyde and Sascha against Callum and Robert, and Michael and Clyde against Stuart and Callum — were more one-sided as Knights extended their lead to 4-0. Michael and Sascha played strongly in the fifth game against Callum and Robert. They won the first set 11-8 and led 9-7 in the second set, only to lose that set 12-10. Callum and Robert capitalised on this, winning the next two sets and sealing a 5-0 win for Knights. Swots had a similarly difficult time in their Division Two league match, losing 7-3 to Comets. Collin Bleak was the best player on the night for Swots, beating both Dougal Ogilvie and Fraser Smith, and combining with Emma Bissett to beat Dougal and Fraser 3-1 in the doubles, having lost the opening set. Emma and Dave Beveridge were unfortunate not to add to the score-board in their singles games, both losing 3-2 to Fraser, and Emma also losing 3-2 to Glenn Christie, who won all of his games on the night. New Kids also had a tough result, losing 6-4 to Villa, in a fixture which saw no fewer than five five-set games. Rising star David Hay was the strongest player in this fixture, beating the New Kids trio of Howard Lee, Kong Wan, and Ian Smith for the loss of a single set to Howard. Howard beat Carol McLean in four close games and was unfortunate to lose to Sandy Bertie, having led 2-0. Ian did well to beat both Carol and Sandy in five sets, recovering on both occasions from 2-0 down. Ian and Howard fought hard to win the doubles against David and Sandy, also 3-2. Kong lost to Carol comfortably 3-0 and faced-up against Sandy in the final game of the night with New Kids 5-4 down. After losing a comfortable first set, Kong fought back to win two close sets and take the lead. However, two excruciatingly close sets saw Sandy close out 20-18, 11-9 to win the game and the match for Villa. Truants achieved the only win this week for St Andrews as they defeated Tigers 9-1. Sascha Roschy and Graham Wood were both in great form, winning all six of their singles games without the loss of a single set and Sascha and Alain Leger also won the doubles 3-0. Alain performed strongly to win his first two games, against Marion Davidson and Kenny McLaren, both in five sets. However, Tigers came away with some consolation as Scott Thomson beat Alain 3-0 in game 9. This win puts Truants to the top of a very close Division Two table at the half-way stage, with Sascha undefeated and leading the averages. Prospects managed to secure a draw against Tass with a great performance from Fabio Sani. Fabio won all three of his singles games, beating Jim Wotherspoon 3-0, being extended to five sets by Jim Houghton and winning 3-1 against Stewart Clark with every set being decided by the minimum two-point margin. Sandy Pearson beat Jim Wotherspoon 3-0 but lost two close four-set games against Jim Houghton and Stewart Clark. Decisively, Sandy and Neil Lea won the doubles 3-0 against Jim Houghton and Stewart. This entry was posted in Match reports, St Andrews Table Tennis Club on December 19, 2017 by standrewstt. Members of the table tennis club know how to party. 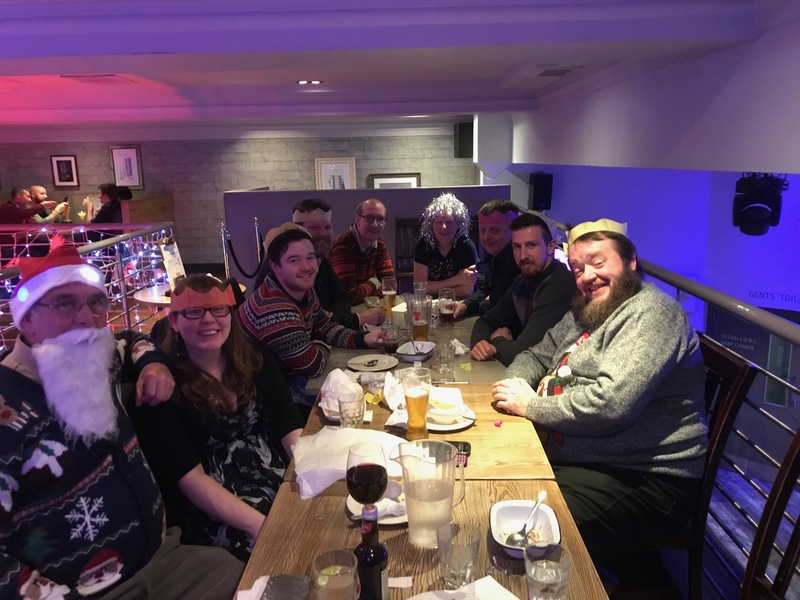 The picture shows the players in festive spirit, celebrating the joy of ping pong fellowship. 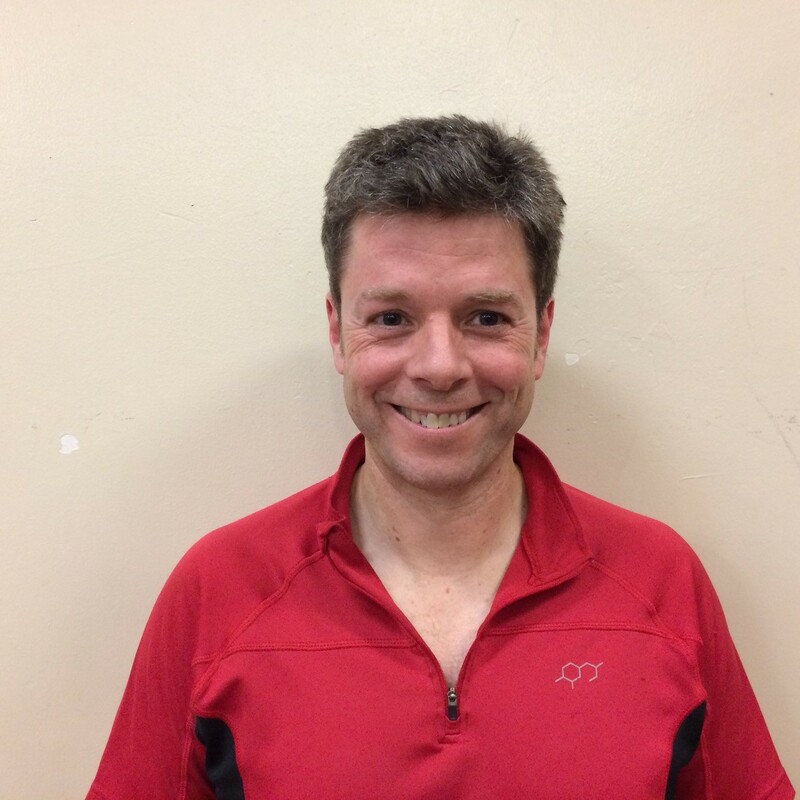 This entry was posted in St Andrews Table Tennis Club on December 18, 2017 by standrewstt. There were lots of matches this week for St Andrews teams in the Dundee and District Table Tennis League, with all four teams with league fixtures being successful. Prefects started the week with a difficult match against Rockets in Division One. However, Michael Hahn and Justin Yang excelled, winning all of their singles games against Pete Yearworth, Peter Dixon, and Gary Lowson, for the loss of only one set each to give Prefects the overall win. Pete and Peter were able to get some revenge as they defeated Michael and Justin in the doubles in five sets, crucially winning the second set 12-10 having been 6-10 down. Bonifac Legrady found the match tough, but was able to win a set against both Peter and Gary. Prefects have now finished the first half of their season of league matches and are comfortable, sitting fifth in the table, and the averages going well with Michael at 93%, Justin at 57% and Clyde Johnson at 56%. All three of the Division Two teams had success in their league fixtures. Swots were 2-0 and 3-1 down against Lundin Lasers, with Arthur Duncan beating Dave Beveridge 3-0 and Nat Forno defeating Collin Bleak 3-1, before Sandy Pearson beat Jamie Douglas 3-1 to get Swots on the scoreboard, but Collin was then beaten again 3-2 by Arthur. However, from then on everything went Swots’ way. Dave beat Jamie 3-0 before Sandy won a close four-set game against Nat. Dave and Collin won a tight doubles game against Nat and Arthur before Swots closed out the game with a trio of singles wins, including Sandy’s excellent 3-2 win against Nat to give him a hat-trick of singles wins, which was particularly impressive given that he was playing up a division. New Kids had a tight 6-4 win against Rollercoasters. 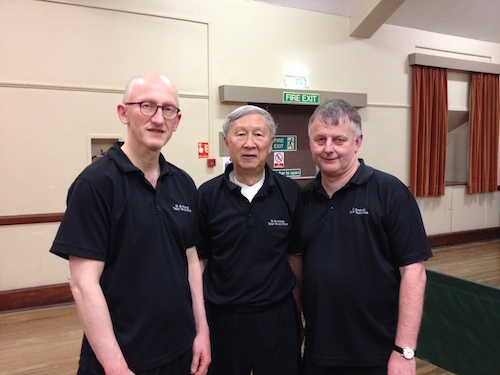 Howard Lee was particularly impressive as he defeated the trio of Marion Davidson, Tony Cook, and Paul Jackson, beating the latter two in five sets. Ian also did well to beat Marion and Paul 3-0 and 3-1, respectively, losing 3-1 to Tony. Howard and Ian combined to beat Tony and Paul 3-2. Kong Wan was unfortunate not to add to the scoreboard, losing 3-1 to Paul, 3-2 to Marion having led 2-0, and 13-11 in the fifth set to Tony. Truants had an important 6-4 win over league-leaders Viscounts, with only four points now dividing the top four teams. Sascha was impervious, winning all three singles 3-0, despite some close scores against Filip Jovanovic. Graham Wood also played well, winning 3-1 against Filip and he and Sascha won the doubles 3-0 against Filip and Andrew Nimmo. Leading 5-4 going into the final game, Graham had a tough start against Andy Hughes, losing the first set, but battled back to win the game 3-1 and secure the victory for Truants. Junior players Murray Paterson, Michael Snodgrass, Keir Paterson, and Edward Coles, who all competed well at the Dundee qualifiers of the Scottish Senior Schools Championships. On Thursday, junior players Murray Paterson, Michael Snodgrass, Keir Paterson, and Edward Coles (pictured) all competed well at the Dundee qualifiers of the Scottish Senior Schools Championships, held at Ward Road Gym in Dundee. 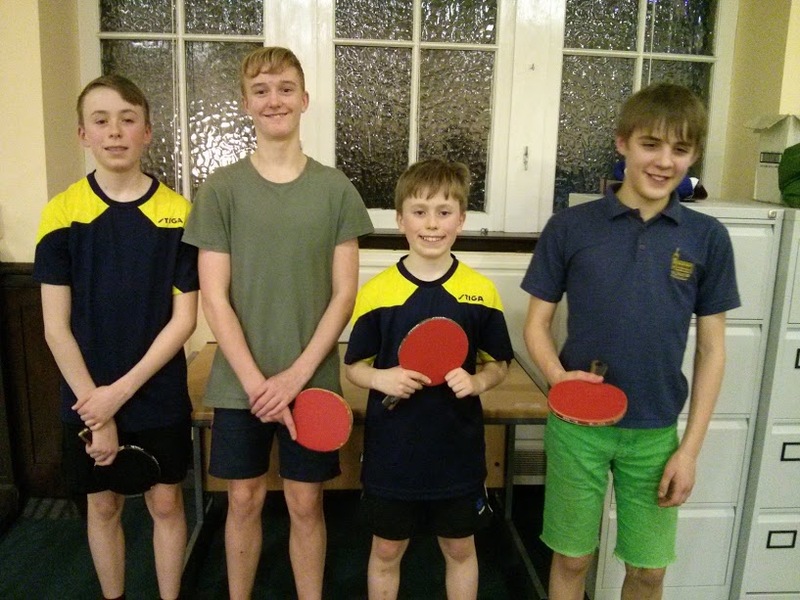 Murray came fourth in the under-14 boys’ event and Michael came fourth in the under-16 boys’ event, and both have been selected to represent the district in the National Finals in February. On Saturday, Ward Road Gym hosted the semi-finals and finals of three cup competitions, the Chairman’s Challenge, the Secondary Shield, and the Consolation Cup, with two St Andrews teams competing. Prefects faced reigning league champions Knights in a tough contest in the Chairman’s Challenge. Things looked bleak as Clyde Johnson led 1-0 against Adeola Fabola, but lost 3-2, and Bonifac Legrady lost 3-0 to Stuart Halliday. However, Michael Hahn led a fightback for Prefects. He first beat Callum Riddoch fairly comfortably 3-1 before he and Clyde won an excellent 3-2 doubles game against Callum and Adeola — including a youtube-worthy dive and around-the-net shot by Clyde to win a point — to level the score at 2-2. Stuart and Adeola then beat Clyde and Bonifac comfortably 3-0 to take the lead again, however Michael levelled the score when he beat Stuart Halliday in four sets. In the deciding game, Callum won a very comfortable first set against Bonifac, but Bonifac bounced back to win the second set however, despite two close sets, couldn’t maintain this and Callum won 3-1 to close the match out 4-3 for Knights. In the other semi-final, Aces defeated Up4It, also 4-3, with the final game being 12-10 in the 5th set. In the final, Aces defeated Knights 4-2. New Kids also faced a tough challenge against Brechin in the Secondary Shield. Howard Lee started well as he beat Aaron Robertson 3-1, and things looked promising as Kong Wan won the first set against John Anderson, but John responded to win the next three sets and level the score-line at 1-1. Derek Mitchell then beat Ian Smith 3-0 and John beat Howard 3-0 to put Brechin firmly in-front. 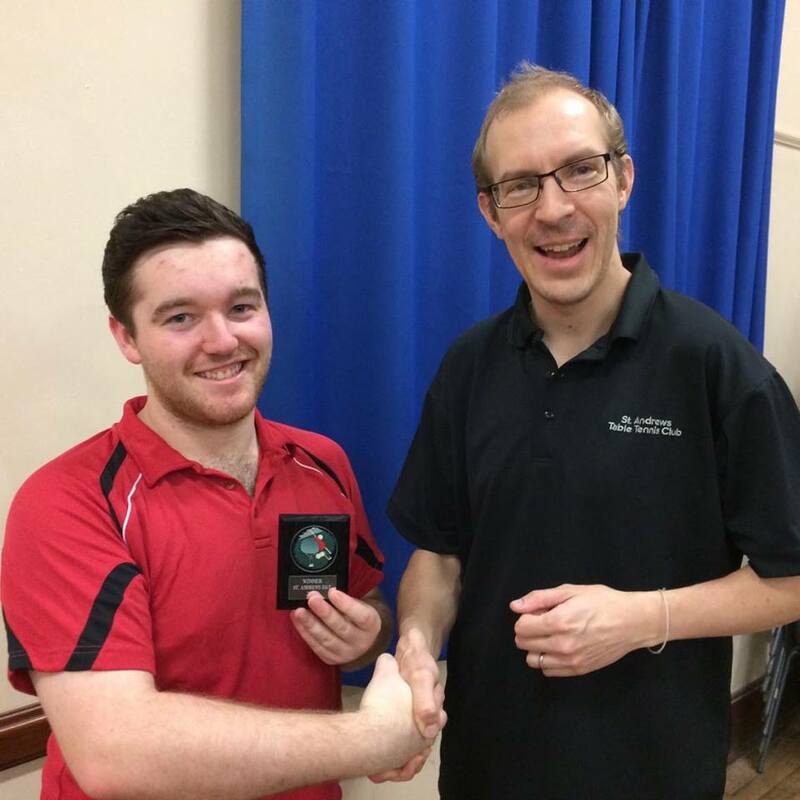 Ian had a good 3-0 win against Aaron before strong 3-0 wins for Derek over Kong and John over Ian sealed Brechin’s place in the final, which they duly won 5-1 against Viscounts. This entry was posted in Match reports, St Andrews Table Tennis Club on December 12, 2017 by standrewstt. It was a busy week for members of St Andrews Table Tennis Club with both matches in the Dundee and District League and the annual St Andrews Day tournament. In Division One, Prefects managed a strong 8-2 win against Thumpers. Michael Hahn and Justin Yang both played very well and lost only a single set each — Michael to Jordan Ednie and Justin to Ian Hunter. Particularly impressive was Justin’s 3-0 win over Jordan in what could have been a very close game. Howard Lee, playing up for Prefects, played strongly and extended all three of his opponents to a fifth set, managing to defeat Ian and losing to Jordan and Tony O’Shea. Michael and Justin lost one set in the doubles against Jordan and Tony, but were otherwise reasonably untroubled in a 3-1 win. Truants put on a very strong performance against Brechin in Division Two, the top end of which is now looking particularly close. Sascha Roschy dominated proceedings, not losing a set in his three singles games, including against previously-undefeated John Anderson. John proved too strong for Knut Radmer and Graham Wood, although Graham was able to win one set. Graham won his two other games, against William Balfour and Aaron Robertson, both 3-1, and combined with Sascha to defeat John and Aaron 3-2 in the doubles. Knut did his part; beating William Balfour 3-0 in the final game to close out an excellent 7-3 win for Truants. New Kids also had a strong win against Chieftains. Howard Lee was the best player on the night, defeating the strong trio of Fiona Kinloch, Jacob Munro, and Jim Tawse, 3-2, 3-0, and 3-1, respectively. Colin Bleak, playing up, also had a good night, defeating Jim 3-1 and coming through in a particularly close game to defeat Jacob, 9-11, 12-14, 11-3, 12-10, 12-10. Kong Wang was unfortunate not to pick up any sets on the night, despite many close scores. Howard and Colin did well to win the doubles against Fiona and Jim, winning 3-1, with all of their three sets being by the minimum two-point margin. Swots, however, had a much harder fixture against Villa, losing 8-2, but were close to having a much more positive result. In the opening game, Emma Bissett won the first two sets against Ian McLagan with ease, 11-1, and 11-3; however, Ian fought back to win the third set 11-8, saved a match point in the fourth set to win 12-10, and then closed the game out 11-8. Colin Bleak was particularly unfortunate to come away with no wins, having had match points in two of his games. He recovered from 2-0 down against Sandy Bertie to have match points in the fifth set, only for Sandy to recover to win 12-10. He also led Ian 10-6 in the fifth set, only to lose the next six points. Emma and Dave were also unfortunate to not win the doubles, having extended David Hay and Ian to five sets. Prospects had a similarly difficult match against Princes. Stewart Mason and Eddie Dougan were too strong on this occasion for Prospects, although Sandy Pearson won sets against both Stewart and Eddie and Dave Goddard won one set against Eddie. The pair of Stewart and Eddie also beat Sandy and Dave 3-0 in the doubles. Dave Goddard had a strong 3-2 win against Derek Johnston, and Neil Lea was unfortunate not to follow suit, having extended Derek to five sets. Sandy also beat Derek in five sets, to close out an 8-2 defeat for Prospects. On Friday night, the club hosted the now-annual St Andrew’s Day tournament. Michael Hahn was seeded straight through to the semi-finals whilst the other players competed in three groups of three or four to join him. The winners of the groups were Graham Wood, Ian Smith, and Howard Lee. Howard drew the short straw and played Michael in the semi-finals. Michael was ruthless in the first set, winning 11-2, and won a closer second set 11-9. He had two match points in the third set at 10-8 before Howard recovered to win 13-11. Michael got revenge by finishing the game with an 11-1 fourth set. Ian played very strongly to beat Graham 3-1, with the fourth set being particularly topsy-turvy before Ian closed it out 12-10. Michael didn’t let Ian into the match in the final, winning 11-5, 11-6, 11-7. The remaining players all played out a consolation doubles event, rotating partners, with Dave Beveridge being declared the winner. This weekend saw Bathgate host the Scottish Schools Primary Championships with Keir Paterson, a P7 pupil at Lawhead Primary School, doing particularly well. Keir won two of his group games but lost the third. He then enjoyed more wins to progress through the early rounds of the consolation event, reaching the quarter finals. This entry was posted in Match reports, St Andrews Table Tennis Club on December 5, 2017 by standrewstt.